This is a very collectible Lower Cambrian trilobite. It is a complete Wanneria walcottana from the classic Kinzers Formation of Lancaster County, Pennsylvania. This colorful specimen was found in a house foundation dig near East Petersburg, not at one of the more common Lancaster sites. The bug is wonderfully articulated and exhibits outstanding detail. The pointed pleural spines are beautifully displayed, and the tiny tail is easily seen. 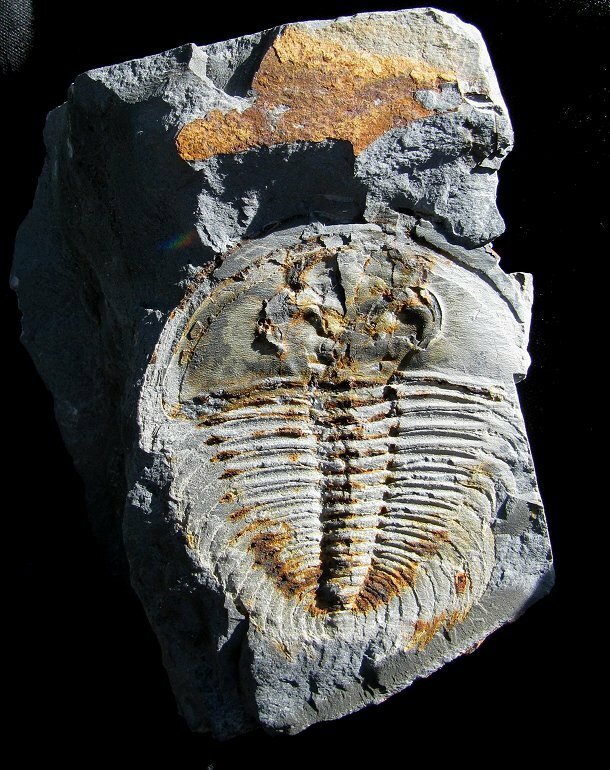 The trilobite is incredibly well preserved - even the distinct reticulated outer "skin", only found on Wanneria and not Olenellus, is fossilized, which is extremely rare. The bug has beautiful, natural coloration, showcasing the classic Kinzers "rusty" look. And this is a split pair fossil - the counterpart is also included! (not pictured.) This is a very cool, very collectible Wanneria walcottana from a once-and-done locality.